When Vandana of Esvasa asked me to do an organic recipe for her website. I knew I had to share this recipe. Esvasa is the only online journal which shares and talks about organic food in India (elaborately). It is an informative site and also features list of organic stores and restaurants across India. They also have a monthly news letter and you can sign up for free! 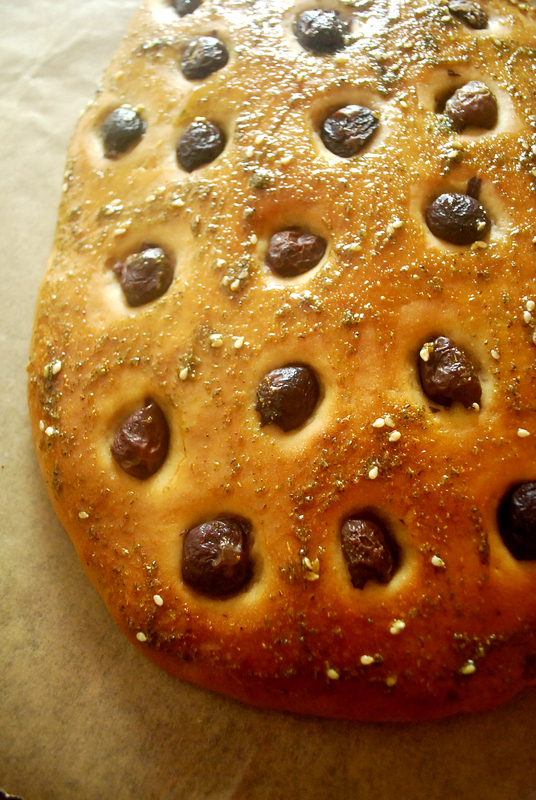 Focaccia is a flatbread, unlike a very thick-crusted pizza. 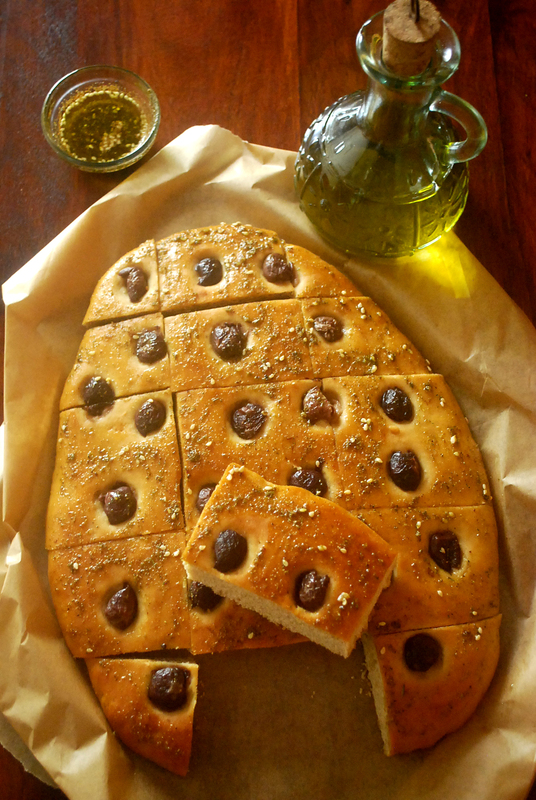 Focaccia is similar to a bread and can be made in any shape or variation. You can use all kinds of toppings and make it taste good but also visiually appealing. A square of focaccia topped with tomatoes, onions or zataar makes a great lunch or snack, and it’s good lunchbox fare. 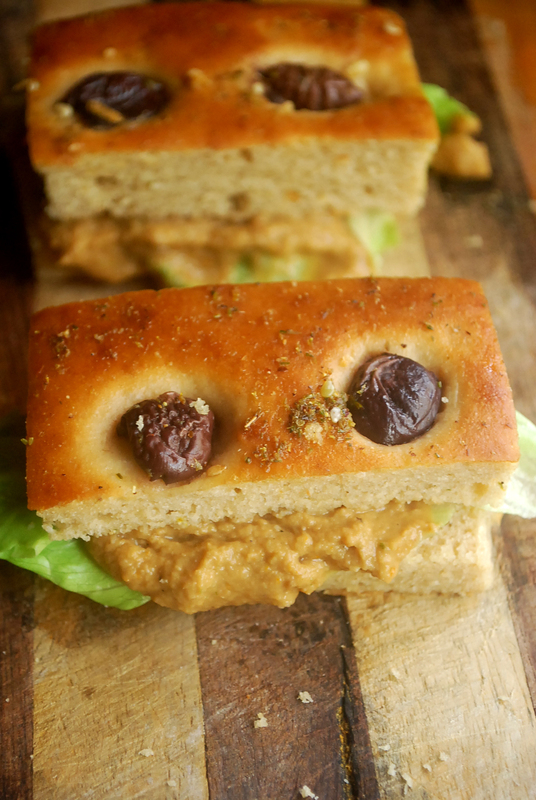 Another thing you can do with focaccia is split it laterally and fill it, to make a sandwich.I made myself a nice focaccia sandwich using yellow butterfly’s sundried tomato hummus. This is a very easy bread. I’m using 100% whole wheat flour and you get a denser than the regular focaccia made with refined flours. You could also use 1:1 variation of whole wheat & all purpose flour (maida) or 2:1 combination. In a glass of lukewarm water, dissolve sugar and yeast. Allow it to stand for 10 minutes until frothy. In a mixing bowl, mix the measured flour, yeast mixture and form a soft dough, adding more water if necessary. Cream the olive oil and salt separately and work into the dough. Tip onto a floured work surface and knead for 3-4 minutes until elastic. Form into a ball and return to the mixing bowl. Cover with cling wrap and leave to rest for 20-30 minutes or double in size. Shape the dough in desired shape and place the dough on the greased tray. Roll or press out the dough into a rectangle the size of the sheet pan. Use your fingertips to dimple the dough all over and place the olives at equal distance. Leave it in a warm spot for 20 minutes or double in size. Bake at 200 degrees centigrade for 20 minutes or until the surface is browned. Brush with some olive oil mixed with zataar and cool on a wire rack. You can keep this bread at room temperature for a day or refrigerate upto a week.